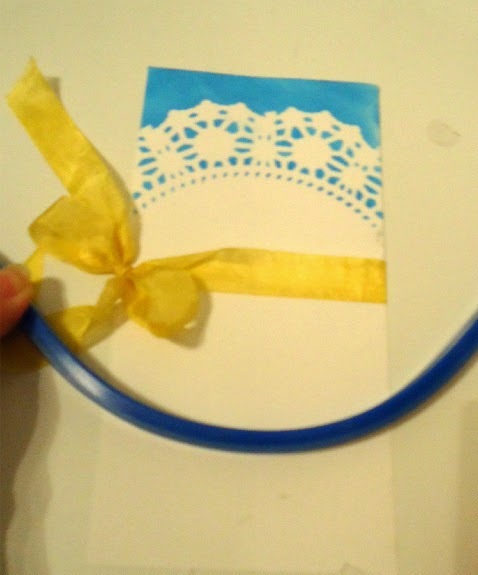 Today is pretty simple - I used a lace doily as a template and created a border with Ranger Distress ink; Broken China. To balance my card I trimmed the bottom with a curved edge. I tied my ribbon to give me an idea of where I wanted to draw and trim my curved edge at the bottom. Using my flexible ruler- I placed it on my card took a pen and traced my curved line. Taking a pair of scissors I trimmed it down. I stamped the tulip cluster onto white cardstock - and stamped just the stems 1/2" below- leaving space for my phrase, Happy Spring. After coloring in my tulips with Copics - I took my punch and created a circle the size I will punch out tulip image. Laying that over the tulips I am providing a circular mask to ink in the background of my image with Broken china again. I applied this a little lighter - as I didn't want to mute the colors of my tulips. Finihed with that I punched out the image. I overlapped the 2 scallop circles and adhered my stamped circle. With the Yellow ribbon tied around my laced inked curved piece I popped the whole thing up on dimensional tape. Next came my phrase - stamped on white with Memento Espresso Truffle ink. *Note: To add depth - I stamped and used my label punch and popped it up on dimensional tape. I finished by adding 3 fish tail trims - 1 stripe pc about 3/4" wide, and 2 other prints both about 1/2" wide. At the upper RH corner of my card I added a layered butterfly. Here's another look at my finished card. 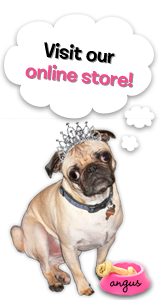 Hello The Rubber Cafe' Fans! 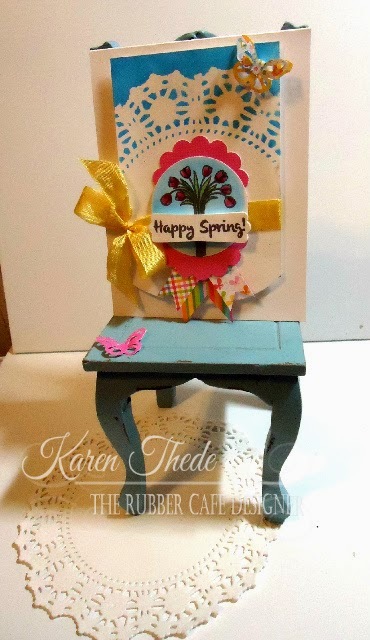 Today I have a quick and easy card to share with you using the April Creative Kit of the Month - Spring is in the Air. The reason I say this is quick and easy is because I am using a paper piecing technique instead of coloring. If you are not wanting to color your images because it takes longer, paper piecing can really be cute and saves alot of time! Here is my card! The base of this card is A2 size - 4 1/4 x 5 1/2". 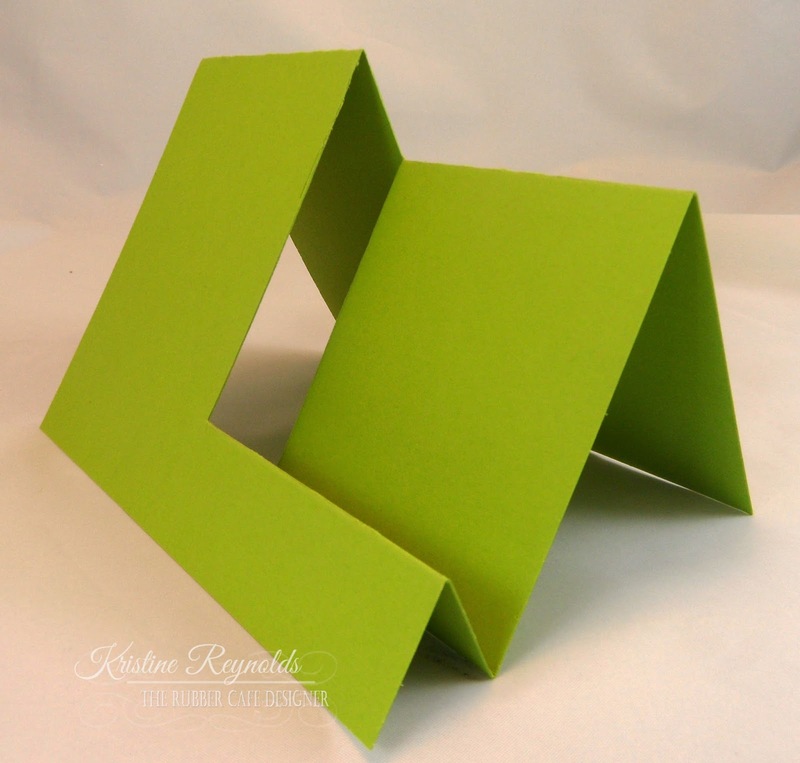 I cut a piece of 8 1/2 x 11" at the 4 1/4" mark along the top of the cardstock and folded it at 5 1/2". Then I cut a layer of white cardstock at 4 x 5 1/4". 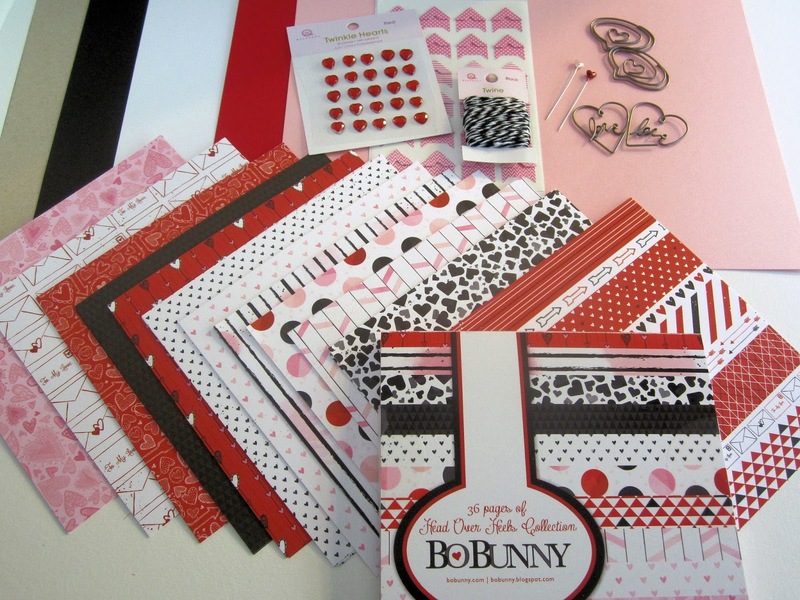 The patterned paper ( included in kit) was cut at 3 3/4 x 5" and layered onto the white cardstock. I added a strip of the blue rain drop patterned paper, which was cut at 2 x 4". I cut/embossed an Elegant Ovals die using the same cardstock as the base. 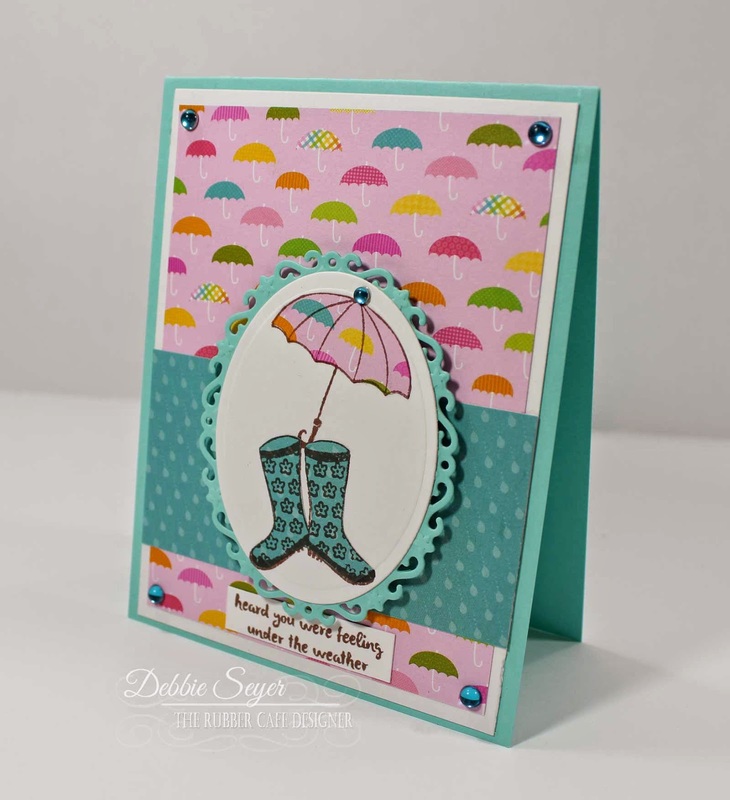 I stamped the boots and umbrella image using Rich Cocoa Memento Ink onto the white cardstock then cut/embossed this using Standard Ovals Lg. 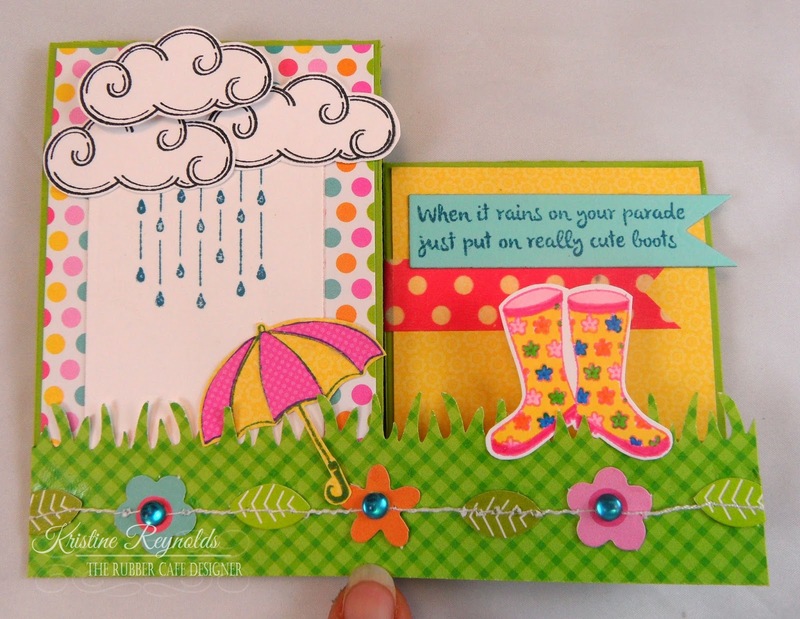 I stamped the umbrella and boots images onto the different patterned paper and cut them out and pieced them onto my die cut. Here is a closer look. I stamped the sentiment onto a small scrap of white cardstock and trimmed it to fit along the bottom of the card. To complete everything I added some 3d foam squares under the ovals and adhered this to the card. Then added the blue bubbles into the 4 corners and on the top of the umbrella. I really love this card and think it would cheer up anyone feeling under the weather! Thanks for stopping by today! 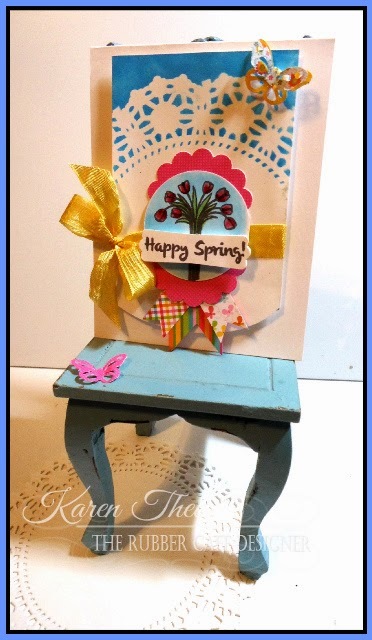 Hope you are enjoying your April Creative Kit of the Month - Spring Is In The Air!! Spring is in the air here in New England and the sun has been shining! 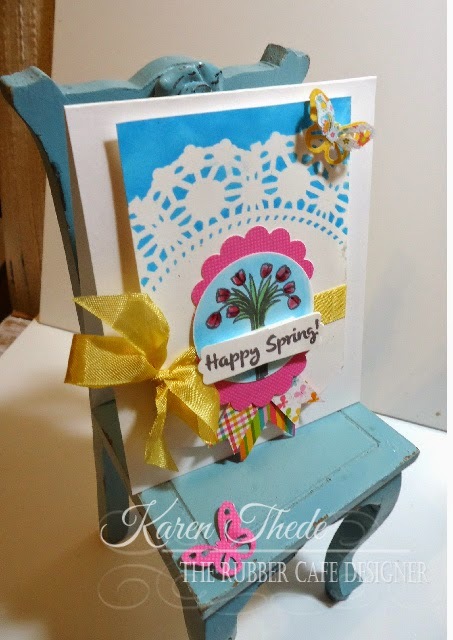 Makes me want to create using the bright beautiful colors from the April - Creative Cafe Kit of the Month Spring is in the Air! I have been missing in action for a couple weeks mending from a surgery and there has been nothing more cheerful than the beautiful stamps and papers in this kit. I wanted to create a starburst effect to use several of the patterned papers. I started by creating a card base and cutting a scrap of paper for the size starburst that I wanted. I then cut the starburst with long scissors and labeled them in order. I used temporary adhesive to attach these to the patterned paper. I wanted to make sure that my papers were all in the correct direction. I then cut these along the templates edges. Placed them down on my cardstock card base with permanent adhesive and using my sewing machine for added embellishment. I then added the floral stamp image and colored with colored pencils. You could use watercolors, copics or any marker you have on hand. I accordioned my ribbon and added my stamped title. 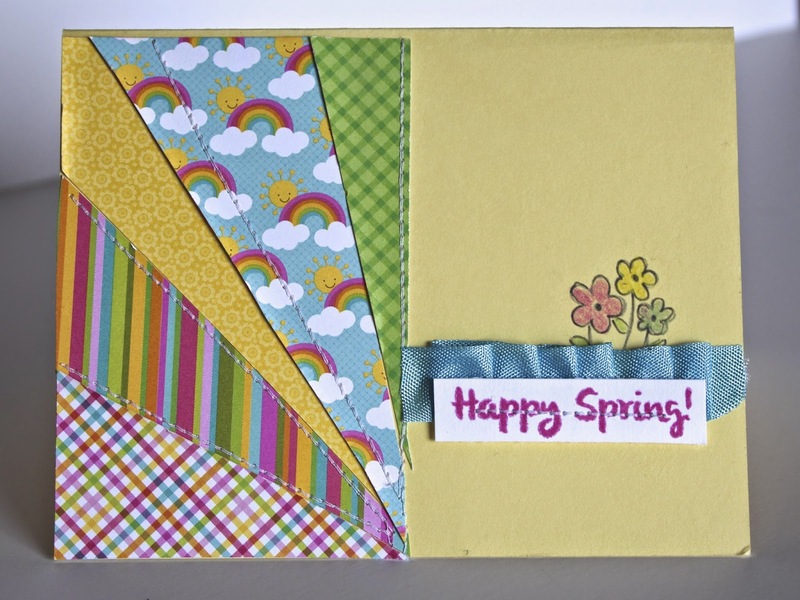 I hope you have enjoyed this simple color packed card and that your neck of the woods is thawing out too! Happy Spring! Hi everyone! 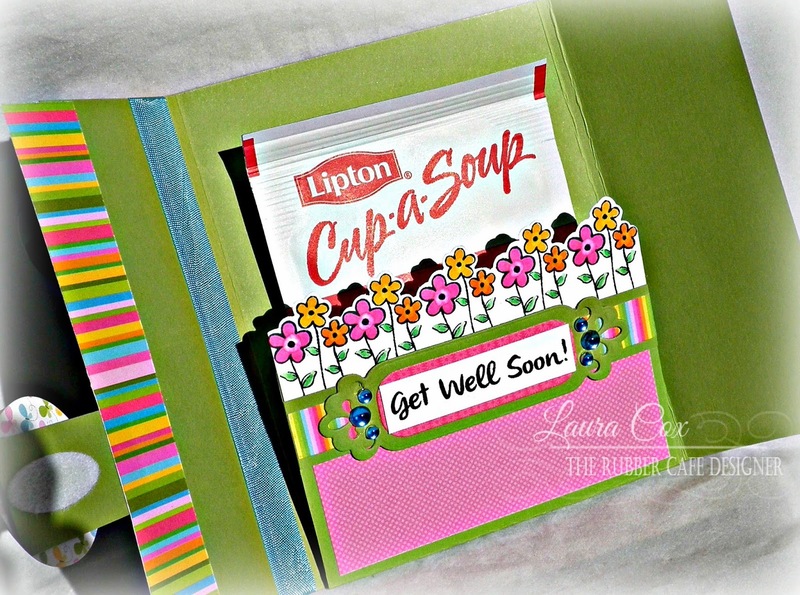 Laura here at The Rubber Cafe' today to share a different sort of "get well" card using the Creative Cafe kit of the month. If you feel like you want to give someone more than just a simple card, this one has a little extra something. 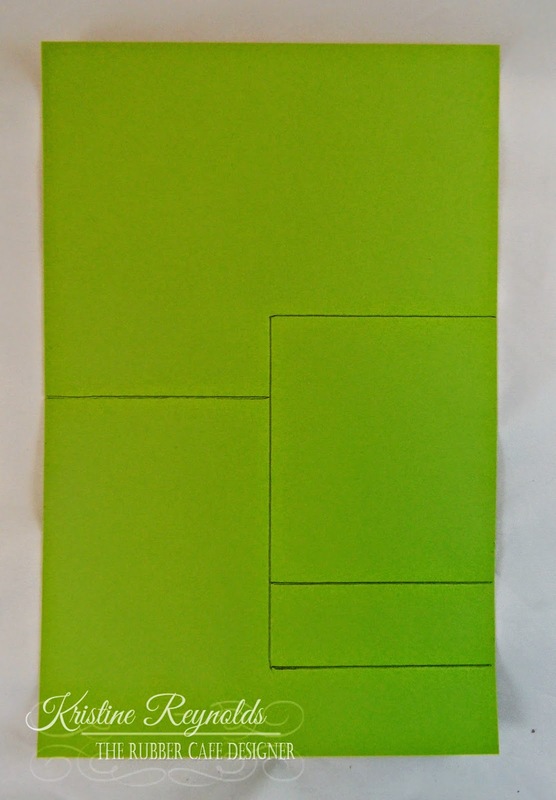 To make this start with an 8 1/2" x 8 1/4" long piece of green cardstock. Score at 2" and again at 2 1/8" down each length, turn your piece a quarter turn and score at 2 3/4" and 2 5/8" in from the bottom edge. 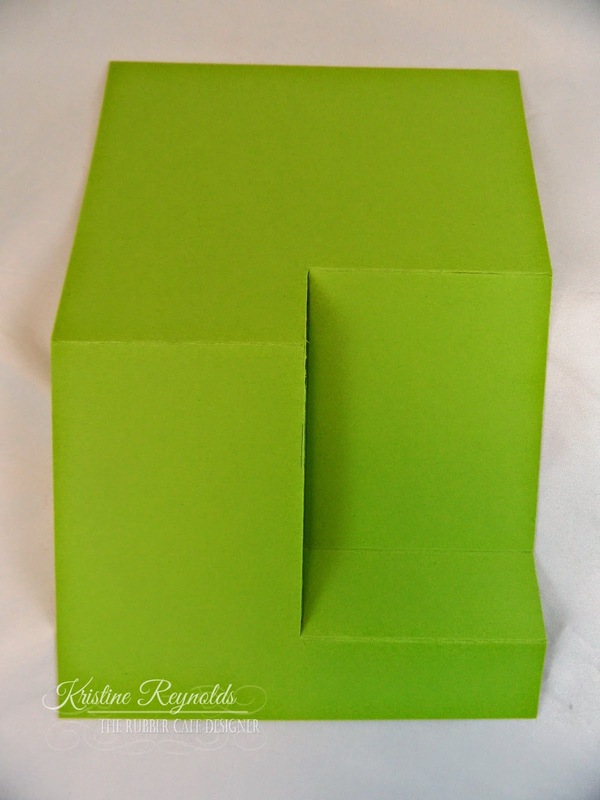 This will leave you with a card that is the standard A2 size, 5 1/2" x 4 1/4" when folded. 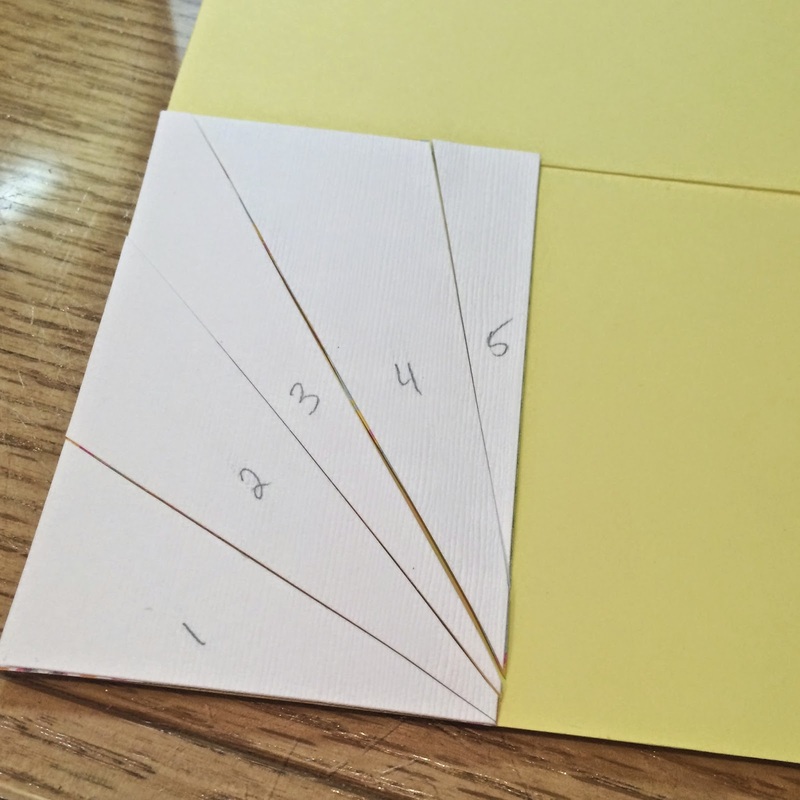 You will then cut out both corner pieces, and fold on all score lines to end up with your card. Note: You should have about a 1/4" gap in the front--don't worry....we want that! To maximize my cardstock and add a bit of interest to the front of the card, I added a 1" strip of pink patterned paper to cover the gap--you could use a border punch for this edge, I liked it plain. Cut two pieces of butterfly patterned paper 5 1/4" x 1 3/4" and adhere using Scrap Happy Glue to the front panels. Add 5 1/2" by 1" strip of pink patterned paper to left front panel (should stick out about 1/2"). 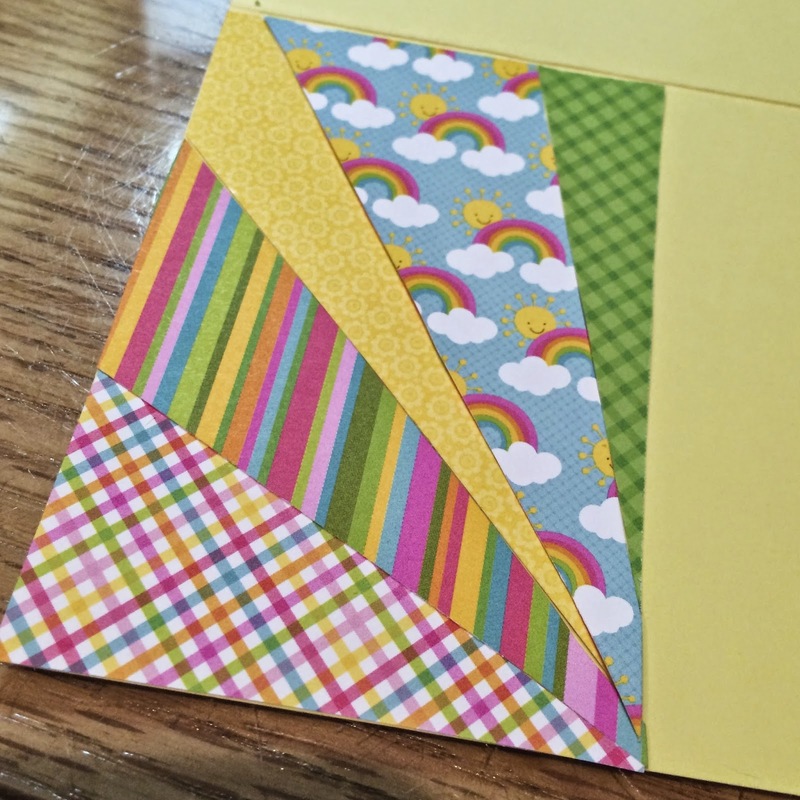 The front strip is 5" by 1" piece of green cardstock, with a 1/2" of rainbow strip patterned paper glued to it. It's scored at 3/4" and again at 7/8" along the left side, to make the tab that is glued to the back of the card. I also glued the rest of this strip down on the left side of the card to hold it well with Scrap Happy Glue. 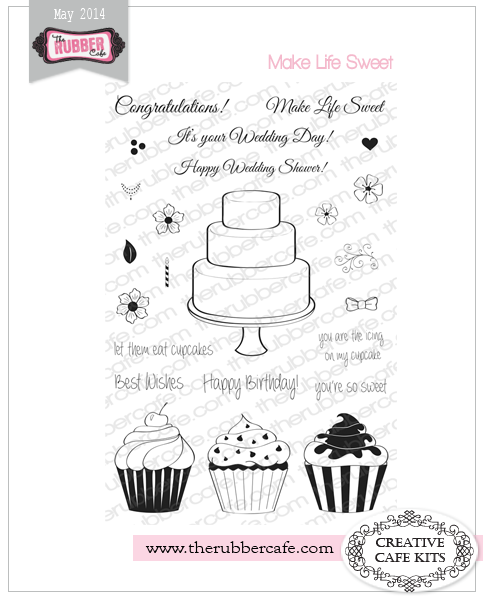 To finish the strip, I added a 1 1/2" pink paper circle to the end of the right side, added the white cardstock banner with the "heard you were feeling" sentiment stamped in Black Tuxedo Memento Ink. I punched out a 1 1/4" piece of white cardstock, stamped it with the raindrops using Memento Luxe Bahama Blue Ink, and adhered that to the pink circle using foam tape. The rainbow was stamped in Black Tuxedo Memento Ink, colored with Copic Markers, then foam taped to the top of the circle. Sprinkles of bubble gems were added to the circle and the front of the card. and a velcro tab to the back of the circle and front of the card to keep it closed as you see here. 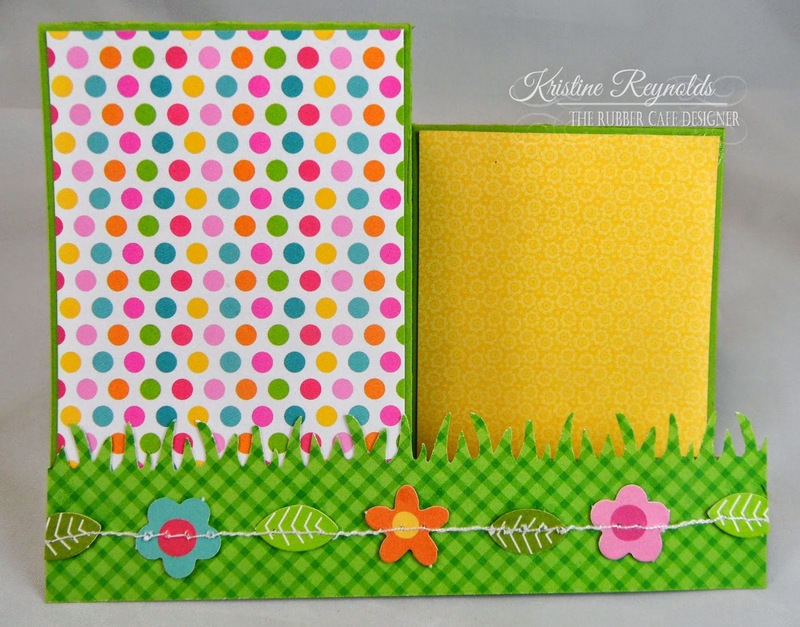 Decorate the bottom flap using a 4" x 1 1/2" strip of pink dot paper. Then stamp the three flowers on white cardstock 5 times in a row (very close....one of the benefits of acrylic stamps!) and color using Copic Markers. Fussy cut around the top edge and trim down to a 4" width and no more than a 1 1/2" length. Glue down ON TOP OF pink dot paper. Along the bottom edge of the flowers, you will make a 4" x 3/4" strip of green cardstock with a 4" x 1/2" strip of rainbow pattern paper and one of the Framed Fancy Tags Two, die cut from green cardstock, with a center cut from pink pattern paper, and the "get well soon" sentiment stamped in Black Tuxedo Memento Ink and trimmed down to fit (about 2 1/4" x 1/2"). Glue along bottom edge of flowers and add bubble gems to finish. Finally add blue seam binding ribbon and a bow (with plastic spoon) around left front panel of card....and insert a cup-of-soup packet to the inside. And there you have it....a souper card for a super person! 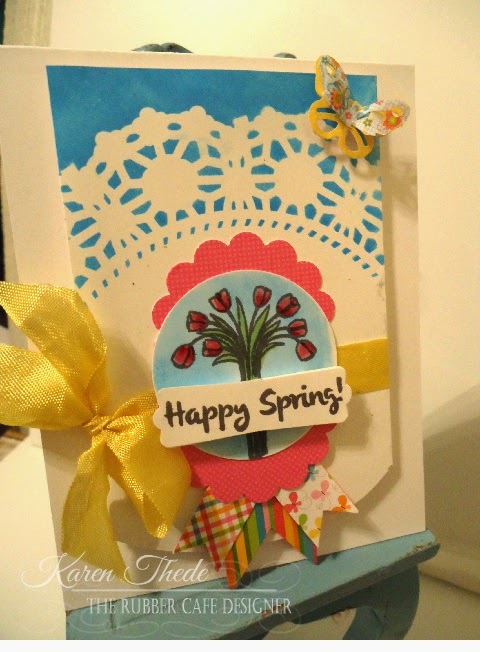 Tools/Dies: Spellbinders-Fancy Framed Tags Two, circle punch 1 1/2"; 1 1/4"
May - Creative Cafe' kit of the Month Sneak Peek! 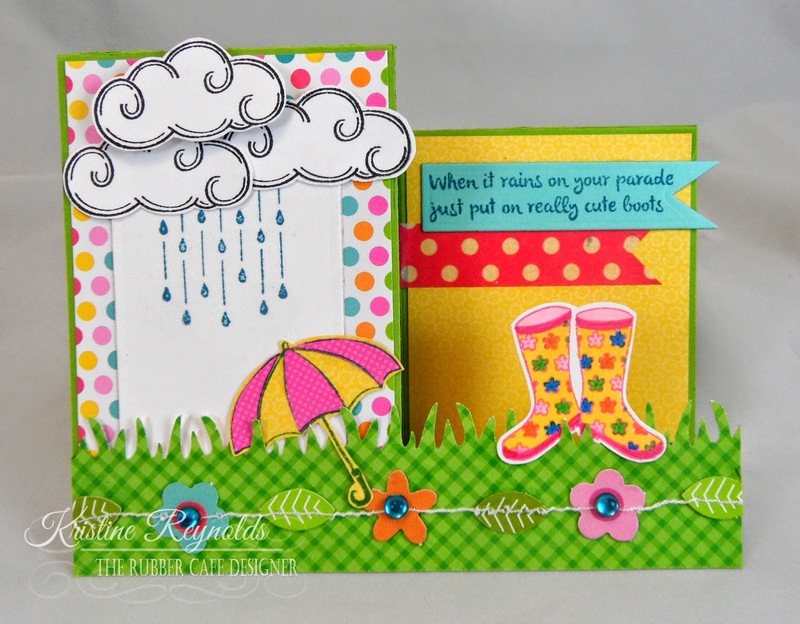 I'm back today to share with you all our latest sneak peek for our Creative Cafe Card Kits! With the month of May we bring you "How Sweet it is"- and sweet it is definitely! You still have time to get in on this month's kit, and during the month of May for added inspiration, the Design Team will be sharing their projects and tutorials with you here so be sure to visit the blog often! So do not delay! Click now to receive your kit! Yes I want to sign up . Hello! 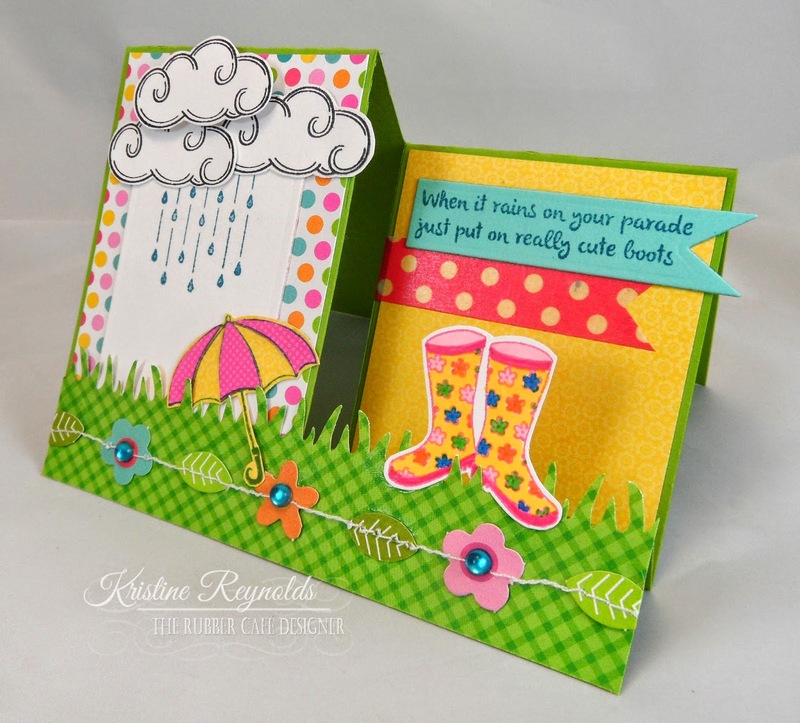 Dawn Rene here today to share a cute tag I made with The Rubber Cafe's April Creative Cafe Kit of the Month. It is bright and cheerful - it just makes me smile! Here are the steps I went through to create the tag. I cut a piece of the orange cardstock in the kit to 6" x 3" and trimmed off the top corners to make the base of the tag. On a separate piece of orange cardstock, I took various sized pieces that I ripped from patterned paper in the kit and randomly glued them on the orange cardstock with Scrap Happy Glue. I cut out the tag shape from the patterned paper collage sheet I just made - 1/4" smaller than the base of the tag. I attached the patterned paper to the base, punched a hole in the top, and added an eyelet to re-enforce the hole. I stamped butterflies from the kit with pink, orange and green colored CTMH inks. Then I colored in the butterflies with a yellow Copics marker. 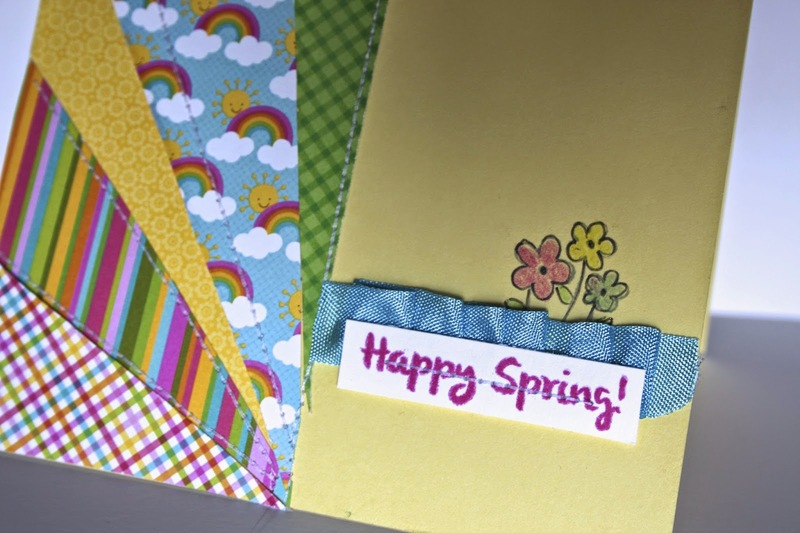 I stamped the "Happy Spring" sentiment from the kit with green ink. I cut out all the pieces and adhered them with Scrap Happy Glue. Strings of the flower garland were tucked under the sentiment so they dangle from the bottom of the tag. The blue bling dots were added as accents. Blue and yellow ribbon from the kit were tied to the top with some white fiber. Embellishments: Ribbon; flower garland; Queen&Co. blue gems all found in your kit; misc eyelets and fiber.